So I think I spend too much time on social networking. And, let’s be honest, most of that is on Facebook lately. I still enjoy Twitter, but I treat that primarily as an information source. I lurk a lot because I find it too difficult to have a nuanced discussion or argument with somebody 140 280 characters at a time. Facebook allows me more than just a snarky comment. I have an Instagram account, which gets a few photos here and there. Most of those are of my dog or my cats, sometimes of something I’ve seen outside somewhere. It’s not exciting, but it entertains me. I have a LinkedIn account which I didn’t touch for about four years, but I’ve recently decided to start updating a little bit. I started a few weeks ago, making the decision to update my work history. I haven’t gotten much farther. But Facebook, much as I enjoy it, is a time sink, and a lot of the time sunk into it really serves no purpose. It’s a great point of social contact, the daily reminders of people’s birthdays are nice, and the system lets you keep in touch with people without all that pesky phone conversation or letter writing, and makes sure you can never completely lose touch with old friends, so long as they’re on Facebook, too. But it’s very, very easy to get lost in the infinite scroll of cat photos and other memes, pseudo-articles and not-quite-advertising, pictures of places you’ll never go, and gross stupidity. Let’s be honest, you don’t really care what I had for breakfast. (In case you do, it was toast. It’s always toast.) Probably, you don’t much care what I did last night unless it was particularly interesting. I’m not going to answer any of your game requests and I will not like and share, nor will I copy and paste, and I will absolutely, positively not type amen. I may laugh if you post something I find funny, cry if it’s something worthy of tears, and like some of the accomplishments you put in your highlight reel. Apparently, I have something close to 400 friends on Facebook. I don’t feel like I ever see posts from some of them, and there are people I’m surprised when I do see something. And, yes, there are people who I’ve hidden because I can’t stand the stuff they do post and discussions are either fruitless or not worth my time in the first place. I’ve had some great discussions and arguments on Facebook. Occasionally, hearts and minds of change. That’s never the objective, but it’s cool when it happens on either side. It’s still too much. It takes too much of my time. Frankly, it’s interfering with my life goals. And I’ve got a lot of those. I have things I want to do, places I want to go, sights I want to see, a world to make a better place. A lot of what I do on social networking isn’t helping me work towards any one of those. But that’s on me, not you. I’m the one using too much of my time scrolling. There’s a meme about how someone can’t go to bed because someone is wrong on the internet. Surprise, someone is wrong on the internet. 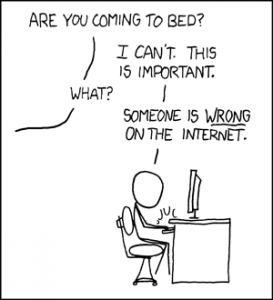 Someone is always wrong on the internet. But unless they’re endangering other people or deliberately lying to them, is it worth a response? Or is it better to leave people in their own echo chambers? I often consider that silence can be taken as implied assent or agreement, so I frequently respond with a quick google search or a link. Sometimes it’s even worthy of a discussion. But I need to consider my own time, too, and whether the audience is even there to begin with. If no one is responding, is it worth the time and energy? Isn’t it better to leave the echo chamber as it is? Right now, every article, every link, every post gets considered before I click on it, react to it, or comment. Will this improve my life or those around me? If I can’t come up with a compelling agreement, then maybe I should just move on, or stop scrolling altogether. I enjoy seeing what you’re up to, what you’re doing with your kids, what you just accomplished, the cool place or thing you just saw. I want to talk about philosophy or politics or religion or major events to keep my brain working, and sometimes to keep my blood warm. But it’s too much. It’s taking too much of my time. I’m not going to finish my current writing project sitting in front of Facebook. I’m not going to get farther than playing the C-Major scale on my saxophone sitting in front of Facebook. I’m not going to hike to the top about Mount Fuji sitting in front of Facebook. I’m not going to go back to school for the degree I actually want sitting in front of Facebook. I’m not going to get back into the appropriate shape to run a marathon or complete a triathlon sitting in front of Facebook. There’s an old cliché about how no one in their deathbed wishes they’d spent more time at work. The same can be said about social media. I’m around, just a little less, and only on the things I think are truly important, or to remind people I remember they exist and appreciate that. And maybe to bring you a feel or two. Things to do, places to go, people to see. I may even post about it. And I may react when you do. We have to live, to experience, to exist aside from just reacting.